Paramount has released the latest featurette and TV spot for Bumblebee, featuring the music of Swiss band Yello and the introduction of the Triple-Changers. While the name of the band Yello isn't necessarily recognizable, their song "Oh Yeah (Yello Song)" is instantly recognizable from Ferris Bueller's Day Off and a number of other movies, TV shows, and commercials from the 1980s. The Bumblebee spot uses the song as a way for the Transformer to find his voice while driving down the road with Hailee Steinfeld's Charlie Watson. It's a fun piece of promotional material that should bring some old school Transformers fans back to their youth. The Bumblebee movie is set in the 1980s, bringing the Transformers franchise back to its roots. The movie takes place in 1987, 20 years before the first Michael Bay-directed installment as Hailee Steinfeld's Charlie finds the mysterious Autobot in a small California beach town. Soon, they find themselves being hunted by the United States government and some Decepticons. From the recent trailers and TV spots, it looks a lot different from the rest of the franchise, which is refreshing. In 1985, Hasbro launched a special set of Transformers that were able to shift into three different things. From robot, to vehicle, and then a second machine. 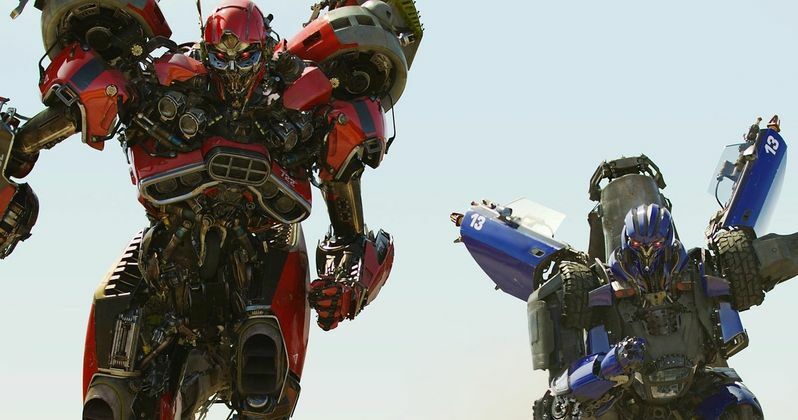 These triple changers were first announced by Bumblebee director Travis Knight at San Diego Comic-Con over the summer and fans have been super excited to see their big screen debut. In addition to the latest TV spot, Paramount has also released a new featurette that briefly describes the triple changers and shows how excited the producers are to finally bring them into the movies. Angela Bassett's Shatter is a Harrier Jet who can also take the form of a red Plymouth Satellite, while Justin Theroux's Dropkick is a Bell AH-1 Supercorba helicopter who also becomes a blue AMC Javelin. Their appearance is going to make things pretty hard on the Autobots when Bumblebee hits theaters later this month. In the featurette, there's a tiny snippet of a scene which shows the beloved Autobot taking a pretty brutal beating at the hands of a Decepticon. Blitzwing will also be featured in Bumblebee, though only in aerial form, not the tank form that he is known for as well. Bumblebee opens in theaters on December 21st, which is also the same day that Warner Bros.' Aquaman is released as well. While the Transformers movie is expected to do well at the box office, it's not going to beat James Wan's first superhero movie. In fact, it's looking like it will earn anywhere from $15-$25 million domestically, which would make for the lowest opening for a Transformers movie yet. However, much like Aquaman, the Bumblebee movie has seen some decent early praise that could generate more traffic in the coming weeks. For now, you can check out the new TV spot and triple changer featurette below, thanks to the Paramount Pictures YouTube channel.